1. Heat oven to 350ºF (180º C). 2. Mix sugars, butter, vanilla and egg in large bowl. Stir in flour and baking soda (dough will be stiff). Stir in the 1 cup of chocolate chips. 3. Spread or pat dough in ungreased 12-inch pizza pan*, or on cookie sheet. Sprinkle the remaining 1/2 cup of chocolate chips over dough, and with spoon push chips down about half way into cookie dough. 4. Bake about 15 minutes or until golden brown; cool in pan. *Note: You can also make this cookie in a heart shaped pan. 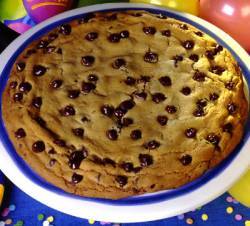 Makes: One (12 inch) cookie. I made this for my church's potluck and it was the only dessert there that got eaten up completely! (and in about 5 minutes too)...It's that good. A little note, though: i only used 1 cup of chocolate chips. i think my dad and i made one of theses once but we used a 9 inch glass cake/pie pan. it came out like a chocolate chip cake, it had to be cooked longer, but it was really good.. These cookies were abseloutly wonderful. I made it when we had a party, or company, and cut it like a pizza, everyone asked fot the recipe. This was such a great cookie to have for the party i had. it fed all of us and tasted WAY better than the giant cookies you can buy at the mall!! great, but just a little too sweet for me!! yum yum yum, that was THE GREATEST COOKIE EVER! We haven't done it yet either but by the way it looks it seems like we would enjoy it!!! It looks good and i have baked it myself. We havnt made it yet but it seems cool and it also looks amazing! !